Last Sunday I was in St Bede's for a Mass celebrated for the intentions for the Latin Mass Society's Sodality of St Augustine. This sodality, which is open to everyone and has no membership fee, prays for the lapsed and non-Catholic friends and family of members. You can sign up here. It was a nice opportunity to attend Mass in St Bede's, where there is a very vibrant EF congregation, which makes an important contribution to the life of the parish. Mass was celebrated by Fr Andrew Southwell, who is back from Rome for the summer where he is studying. 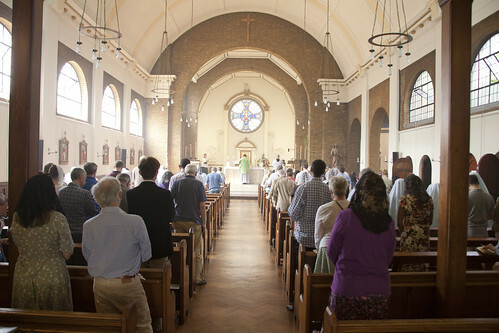 The Latin Mass Society promises to organise at least one public Mass each year for the Sodality's intentions; members can organise more, and offer extra prayers and so on as they like. There is a short Sodality prayer which members say each day, which is the collect for 'Devotis Amicis', for friends, which can be added as an extra collect at Masses (under certain conditions blah blah blah). The idea is that the annual Mass the LMS pays for is done with a degree of solemnity; last Sunday's Mass was accompanied by polyphony provided by the Cantores Missae of Charles Finch. 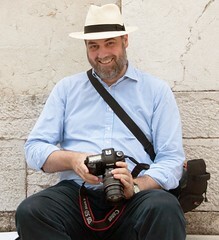 I was asked recently if I thought the EF was associated with a higher number of confessions. There aren't any figures on this that I know of, but anecdotally the correlation is pretty clear. 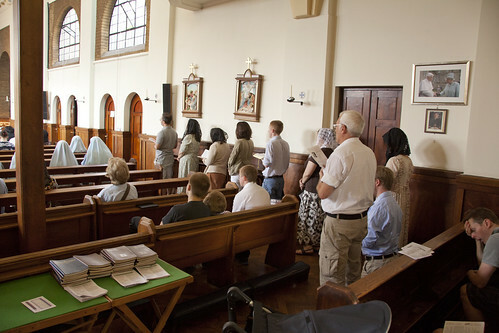 Here's the queue for confession in St Bede's early in the Mass. It is in no way unusual for St Bede's. 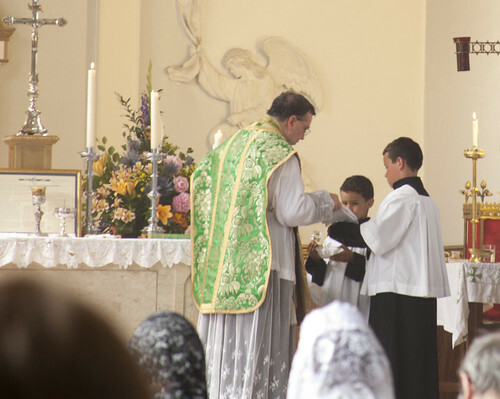 The Tridentine Mass is,as I think Fr. Faber said 'the most beautiful thing this side of Heaven'. As for the latter thing, of course it is. I try to go to confession fortnightly (nothing like enough! It should be weekly) but I heard a parishioner at the Novus Ordo say they 'hardly ever' received the Sacrament. The buggering up of the Church is a great sorrow to me (Waugh). 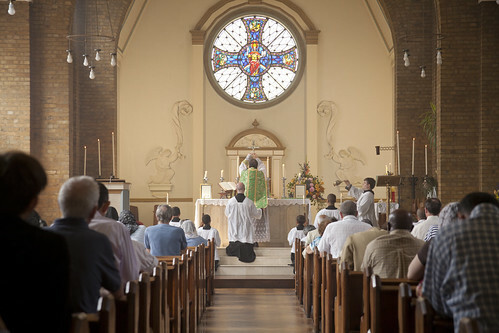 One reason why people are more likely to go to confession at an EF Mass is that traditionalist priests make the sacrament more readily available, being willing to hear confessions before or after Mass (or even during it, shock horror!). Contrast this with my experience in many Churches on a Saturday evening, where you have to keep a vigil outside the confessional in hope that the priest will turn up (probably from his round of golf).